The Standard Stud (2908/03614) is included. This item replaces old catalog #2900. Box Dimensions (LxWxH) 5.6 x 4.2 x 2.4"
035RL Super Clamp with Standard Stud is rated 4.8 out of 5 by 261. Rated 4 out of 5 by Dr SCSI from Buy Several, You Will Use Them! Perfect for clamping to light stands, poles, and flat surfaces; I even clamp it to my tripod legs for supporting speedlights during macro work. Just don't clamp it down too hard on a set of carbon fiber legs, or you might crack your expensive tripod. Supports your speedlights, studio lights, and or camera. Stong and durable item, a bit bulky and heavy, but this is expected for the forces it will be expected to overcome. The knobs and threads come pre-greased so be sure you wipe off the excess grease or it could end up where you don't want it. The knob placement could have also been better thought out. Rated 5 out of 5 by Michael C. from More useful than originally thought I bought this hoping I'd be able to stick a Lastolite TriFlip Grip Reflector Kit onto a light stand or tripod despite not finding others writing about it. It works! When combing the two onto a small tripod of mine with a sandbag to help direct light, it's very flexible for getting light where needed. As a bonus, I've come to realize this clamp will help me place off camera flash in places there's no room for a tripod or light stand. This clamp is now riding in my go bag. That means it's a used piece of equipment. Rated 5 out of 5 by Ron1980911 from Very Useful There are many uses for this product...not just for photography. One suggestion for improvement would be to use a similar handle/locking system that they use on their tripod heads with this type of handle, whereas the user can tighten the clamp, but then pull up on the handle to rotate it to a different position, thus out of the way. The way it works, now, the user must leave the handle in whatever position it ends up in when tightened, which means that it may sometimes be in the way. But, that is a small price to pay for this excellent clamp. Rated 5 out of 5 by mph66 from Excellent for what it is billed for, but I got this clamp to clamp my mini video camera to my bicycle to get my favorite ride(s) so that when winter comes, and I'm riding indoors on the trainer, I'll still get the memories of my favorite hills and fields. This clamp is super-secure, and the stud locks into the clamp perfectly. I hit 40 mph going down a hill and the clamp held fast. On the other hand, clamping a video camera with no IS to a bike handlebar isn't the smartest thing I've ever done. It was 90 minutes of quake-cam. But I can't fault the product. It's rock-solid. My camera is a Flip Mino HD, but I would venture that you could easily put a mini DV camcorder on this unit with no problem- complete faith in the durability and design of this clamp. Heavy duty, well-built. Rated 5 out of 5 by Fiber Girl from Great Hold I use the Super Clamp to attach my Manfrotto 244 Variable Friction Magic Arm With Camera Bracket to a pipe that is braced to my design table, all for over head video filming. Rated 5 out of 5 by DeepDiver from Buy this one! I have one of these and bought what I thought was the same thing but found found the one I had picked was made in China and clamp was a close match but the stud was not. I returned it and bought the Manfrotto model instead. Buy this one the first time and save the money you have to pay to return the imitator! Rated 5 out of 5 by Anonymous from Unexpected plastic but good performance Super Clamp holds well on round surfaces as-is. There is a plastic wedge-shaped insert, supplied with the clamp, that is stored outside of the main body of the unit and is held in place by the knob that is used to tighten the spigot. If you loosen that knob and remove the wedge, you can place the wedge inside the clamp and then the clamp will attach firmly to a squared-off surface such as the corner of a table. Watch for copious amounts of grease protruding from the screw threads and on the end of the screws - I suggest you clean the factory grease off but every time I use the unit I still end up getting grease on my hands and have to wash them before touching cameras or light modifiers. The main tightening handle is plastic and is somewhat disappointing. 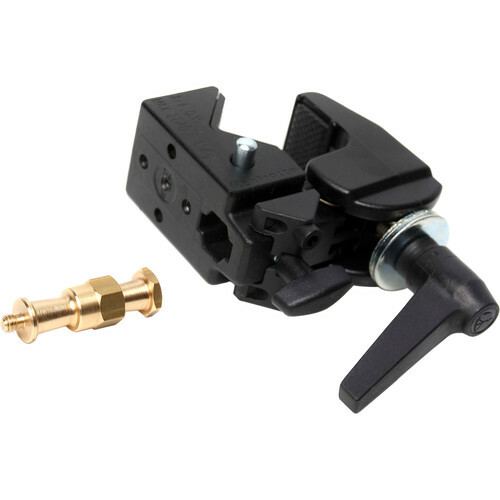 Unlike the metal handle used on, for example, the Manfrotto 026 swivel umbrella adapter, this unit does not have a ratcheting mechanism with a button on the end of the handle, so the only way to tighten it is to move it around in a circular manner, which takes a lot more room than a ratchet handle would. If the handle and wedge were metal and if the handle had a ratchet I would give this clamp 5 stars; in this case I think 4.5 stars are in order so I will round it off to 5. Recommended. Rated 5 out of 5 by Robtography LLC from Solid, Given the Right Application I'm a sports photographer, and I use Magic Arms with SuperClamps to mount remote DSLR cameras. The Clamp works very well on 1-inch and 2-inch diameter pipes, which are ubiqutous in most sporting venues. So long as I can get the jaws around the desired mounting spot, the Clamp is easily tightened and remains in position. I find I cannot secure the clamp to 4-inch pipes (which are also commonplace) or chainlink fence. The Clamp is strong and durable, though I'd like to see metal tightening arms rather than plastic. What is the smallest diameter tripod leg this can effectively clamp onto? Mine will clamp down to 3/8&quot; dia. Is this the correct stud to attach a standard tripod head (such as the 494RC2)? If not what stud should I order please? The stud included with this Super Clamp would not have the correct screw thread to fit a 494 RC2. What is best to use is the Manfrotto 208HEX Head Mounting Plate with Hex Stud - 3/8 Thread B&amp;H # MA208HEX which connects into the hex slot on the Super Clamp and has a tripod base plate on top with a 3/8 thread for attaching a head like the 494RC2. Please see the image below for reference. is the main handle on this made out of metal or plastic, along with the interior threads? I've had versions that were plastic and the threads strip out rendering the clamp useless. The handle is plastic. Hardened plastic, the interior threads are not plastic. Is this the same model with (Manfrotto 035 Super Clamp without Stud) but it include stud ? whats the weight load max for poles and clips? I have not tested the maximum weight the super clamp can support but it definitely will hold a strobe head with a softbox in place firmly. It will easily hold in place a backdrop bar with heavy weight muslin on it. That's as much weight as I have put on one. Hope this helps. I am looking for something to be able to attach miscellaneous items to a light stand, such as a stuffed animal, floral bouquet or whatever for modeling purposes. I have a Manfrotto Nano Light Stand and Swivel Tite Umbrella Adaptor. What is a person to do? Just use velcro, string or whatever to hang items from the light stand? Thanks. Search for, Clamp-on tripod with flexible neck. How can I clamp 5d Mark 4 using this clamp.?? It should screw right into the bottom of the camera body and clamped to an sturdy structure such as a pipe, bench or pole. Could these be used to mount lights like an Arri 650 to a truss? The Arri 650 only weighs a little over 7.2 lbs so it shouldn't be a problem. Just make sure (of course) to safety cable it.